Look at your basic wireless charging pad and what do you see? Typically, it’s an uninspiring slab of plastic with a magnetic coil hidden inside; not something I’d call “fashion forward.” The team behind Swich aims to change that perception with a Kickstarter project for a wireless charger that’s actually nice to look at. Swich, which uses the Qi charging standard, serves dual purposes for iPhones(s aapl), Androids(s goog) and Windows Phone(s msft) handsets. The top and bottom of Swich are made from ceramic while the middle section is produced from American Walnut hardwood. It’s a striking, yet practical design. 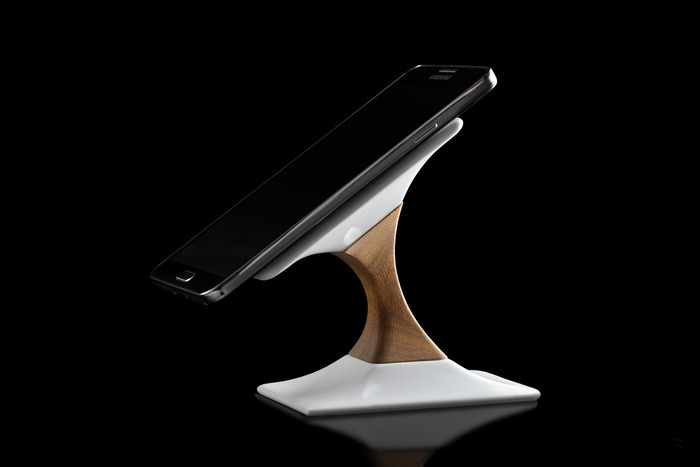 The product name of Swich aptly describes how your phone can be used on it since the top section rotates 90-degrees. That means you can use your phone in either portrait or landscape model while Swich charges the battery. While there are some handsets that natively support the Qi wireless charging standard — the Nexus 5 and some Nokia Lumia devices, for example — the Swich team is offering a $10 add-on for phones that don’t work with wireless chargers. In the case of the iPhone, that’s an actual case, while other handsets can use a slim attachment similar to the iQi I tested last year year. That ten dollars is a drop in the bucket compared to the Swich however. The project has already met its $25,000 funding goal and the early-bird pricing special of $140 is gone. To back the project and get your own Swich in choice of black or white, you’ll have to spend $170, which is far more than most other wireless charging pads. Of course, none of the others look quite this good!